What beautiful photos and recipe! I had forgotten that I used to make cream puffs and such...how silly of me! Well, goodness this is all just too delightful and I would just love the chance to win this. Happy Thursday and thank you for joining us today at Thoughts Of Home On Thursday! Jemma, thank you. Isn't it funny how different foods just seem to "fall out of our rotation" until something reminds us! Hope you'll make some soon. Thanks, Lisa. I hope you'll try it soon and let me know how it turns out for you. Lidy, thanks so much. I was delighted to discover your blog today and look forward to visiting it again very soon! Glad to find another Le Creuset fan as well. All I can say is, "Yum!" Your cream puff looks amazing! I have never made them and I don't know why. Thanks for the inspiration and thank you for sharing. Have a beautiful day. Sandi, I hope you'll make them soon. They really are wonderful. When my English grandmother made her rounds to her children's homes throughout the year, she always made these and they've never been forgotten by her grandchildren! You have me crave for some cream puffs with pastry cream! An excellent recipe, Jean. Thanks, Angie! I'm craving them, too, and will be making another batch very soon. I would estimate that 80% of our meals are cooked on the stove top. With the pan being stainless, I would use this for recipes that I can't really use a non-stick pan for, particularly anything that requires a whisk. I think gravy would be one of the first things I would make. Yes, perfect for gravy, 1froglegs! Alicia, I love chicken fettuccine alfredo, but not just plain fettuccine alfredo, gotta have the chicken! I also follow you on twitter @TheHippieHut. Thanks for the chance! Brenda, I hope you will make them. Pastry recipe next week. Maybe you'll be able to make them in the pan! 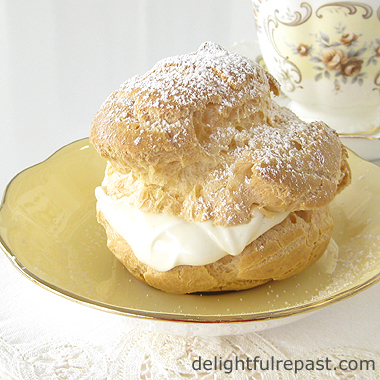 Cream puffs were always one of my late beloved's favorite desserts that I made. Once I made them into swans for our annniversary, and they turned out cute. I have to admit that I only have a small saucier and would love the Le Crueset saucier. I would definitely be making your pastry cream! Kitty, I bet those swans were cute! I don't get that fancy, though, I just plop the dough on the baking sheet, and that's that! The pot would be one of my favorites, too. I follow LeCreuset on twitter @rusthawk. Some ginger syrup for springier smoothies. Thanks for the giveaway! p.s. forgot to enter my email. Rusthawk, thanks! And, yes, it IS possible to lose one's taste for chocolate, though it probably doesn't happen too often. I'm the only one I know! In an effort to eat more healthfully, I often have oatmeal for supper. This looks like a good pan for that. I love cream puff and eclairs but I never thought of cream puffs as cookies and I was surprised to not see the link up in your post for Fill the Cookie Jar where you added this post. Leslie, yes, it is a great pan for oatmeal (I know because we eat oatmeal nearly every day!). Anonymous, the cream puffs and eclairs recipe is coming next week. This recipe is for just the pastry cream, something that people can also use for custard-filled cookies. I'm always so delighted when I come and visit you here, dearest Jean, you always leave me in awe, your recipes are truly wondrous ! Thank you, dear Dany! And I'm sorry the giveaway is not open to my readers outside the US. Some of my giveaways are, though, so you'll be able to enter some! Hi Jean. Le Creuset pans bring back a few memories. The original pans were made with an orange lacquered exterior I think. Tony, Le Creuset started long ago with the orange (called "flame") enameled exterior and now have all sorts of colors, but I still love the flame. What lovely memories of Paris you and Marilyn have! Jean this is such a wonderful opportunity! I have a Le Creuset Dutch oven and I love it! Your post is such a happy addition to Thoughts of Home on Thursday. Thank you SO much for sharing the joy. Thank YOU, Laura! It's my pleasure to share these wonderful things with my readers. Wishing you a wonderful weekend, too! Jean this looks so delicate and professional, i would never be able to make this. I bet it tastes delicious. Thank you for sharing at #WonderfilWednesday. Pinned and shared. Marilyn, you are too kind! :-) Thanks very much; your pins and shares and comments are soooo appreciated. The first thing I'll make will likely be a white sauce of some kind. I use this in a variety of recipes. Here's my recipe: http://www.ahhthesimplelife.com/white-sauce-wizardry/. I've followed Le Creuset on Twitter. My Twitter name is @ahthesimplelife. I've followed Delightful Repast on Twitter. My Twitter name is @ahthesimplelife. Carol, I'll check that out. Many sauces start with a white sauce. I make a lot of sauces because my husband doesn't like just a plain unadorned steak or chop. Hi Jean, Happy Weekend. Such a lovely giveaway. John and I eat oatmeal just about every morning; this pan seems good for that although I would love to have your cream puffs! Tiny ones for tea time would be so sweet. I was thinking of you earlier today while editing photos of my cat. You always seem to enjoy the cat pictures! 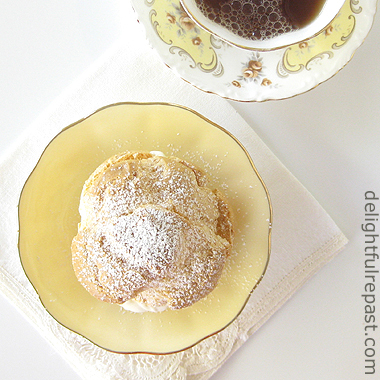 My husband loves cream puffs ... this I am going to have to try! What a neat pan ... certainly would take care of the "stuck in the corner" problem. I've followed Le Creuset on Twitter. I've followed Delightful Repast on Twitter. My Twitter name is @SherryTCOH. Thank you, Mildred! And, yes, I do so love your cat photos! Cats are simply the most wonderful animal. Ann, so good to hear from you! It's been a while! Hope you are both well. Sherry, love The Charm of Home! Hello Jean~~ Had you not come for a visit I may have never found you, and what a delicious blog you have! I had to follow along with you, especially after seeing those cream puffs, oooh those are my ultimate favorite little desserts. As a child I would always choose a cream puff when mother took us to the bakery. Your give-away is gorgeous, and I'm sure it would cook up a delicious cream sauce. Annyeong. Thank you very much for dropping by my little blog. These cream puffs look so delicious! They made me drool. You are talented. Debbie, thank you so much! Cream puffs are luscious, and they always remind me of the wonderful times when my English grandmother came to stay and she and my mother would make all sorts of cream puffs and eclairs. Of course, they also made some stuff I'd rather forget, like steak and kidney pie! Ann, you are so kind! Once you make these, you will be amazed at how easy they are! These look absolutely sinful, and so worth it! Delightful! I follow Delightful Repast on Twitter. I think this would be perfect for making homemade oatmeal! Ash, it IS! We eat oatmeal nearly every single morning. I haven't made cream puffs in years. Thank you for the inspiration. I'd make cream puffs and serve them filled with gelato and topped with chocolate sauce. I follow Le Creuset on twitter @amylou61 . Sorry I forgot to type my email in my first comment. Amy, that sounds wonderful! We like gelato. This looks like a good pan for some Indian dishes I've been making lately. Lindsay, I need to try more Indian dishes! My mother always made the best cream puffs and they were always requested when she was attending a function. I love the pan and I believe I will make your recipe in it! Okay, now I'm hungry and it's past midnight. I just pinned your recipe and I think I am going to give it a whirl tomorrow. The first thing I would make in the pan is breakfast, our morning oatmeal. My favorite lately has been with diced apples, raisins, candied pecans, cinnamon, nutmeg and a drizzle of maple syrup. I follow Le Creuset on Twitter with the handle @FireRunner2379. Carol, thank you. And do, please, let me know how it turns out for you. FireRunner, that sounds really good. I always have my oatmeal stone plain! The first thing I would make in the lovely saucier is the recipe you provided today. - is it the same pastry cream used for trifles? 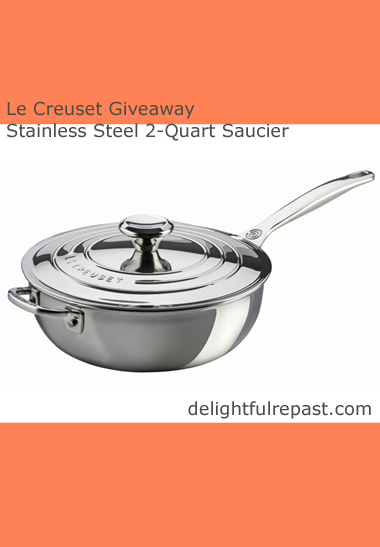 My birthday is the 14th so it would be very exciting if Charulie@msn.com was the winner of the saucier. Julie, thanks! Yes, you can use the pastry cream for trifle. Be sure to look up my recipe for individual trifles. I think I would take some of the lovely Meyer lemons off my in-laws tree and make some lemon curd. A nice lemony tart would be lovely in the warm weather. 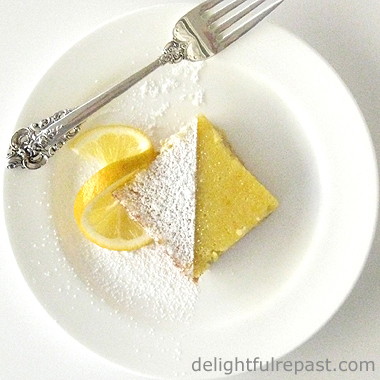 Ohh, Tina, you're speaking my language -- I love lemon curd! My husband would love to have home made cream puffs but since I don't eat them I buy him one from the bakery now and then for a treat. Le Creuset makes very durable cook ware of which my daughter has a few but my stainless steel pots are from Paderno in PEI, Canada. I sure like reading and trying some of your recipes Jean. Judith, thank you. And I'm going to enjoy reading about your garden through the summer months! I'm afraid, so far anyway, I'm just going to be an armchair gardener this season. This looks wonderful! Making this, is on my MUST TRY list! Thanks, Dina! Be sure to come back Thursday for the choux pastry. Pasrty cream looks delicious Jean, Lovely pot, Thanks for sharing with Hearth and soul blog hop, tweeting, pinning. Swathi, thank you so much, my sweet bloggy friend! Thanks, Alicia. I hope you'll try it soon and let me know how it turned out for you. And I really do think it is a perfect pan! What beautiful cream puffs! I love your recipe for Vanilla Pastry Cream - it's such a classic! Le Creuset are my favourite pans and their stainless steel is just amazing. Wish I could enter but as I can't, I'm sharing so that my US friends can! Thank you for sharing this great giveaway and delicious recipe with the Hearth and Soul Hop, Jean. April, thank you so much for sharing. Much appreciated! I would make this Vanilla Pastry Cream! I have been wanting to make cram puffs for a while now!!! Jean, that does look like a wonderfully useful pot. After reading your recipe for the pastry cream, I will have to try it with that pot or with one of mine! Can't wait for next week's recipes to make the up whole recipe together! Lindsay, I hope you'll like them as much as we do! I'm making another batch tomorrow! Lily, I'm so glad you're going to try them! Do let me know how they turn out for you and let me know if you have any questions. OMG I need this. I follow Le Creuset on Twitter. My name is @KeriEjustice. And I'm so trying your recipe! I am making this first if I win this amazing pan! I loooooove cream puffs. Do you think you could add cocoa and make it a chocolate pastry cream? Would love to try both. It looks amazing! This would be a good way for me to use up some chicken eggs. I have way too many building up right now. Keri, you will LOVE this pan! And, yes, whisk about 1/3 to 1/2 cup natural unsweetened cocoa with the sugar and starches for chocolate pastry cream. I think I'd try it with 1/3 cup the first time. Thanks, Cindy! I'm making more today! Jean, I am thrilled to have this recipe! I am much more a vanilla person than chocolate and this is one of my favorite fillings. Oh to own a piece Le Creusett! Thanks for sharing with SYC. Jann, thanks so much (and for hosting SYC)! There are a few of us who prefer vanilla over chocolate. This is my favorite pan ever! Although I love chocolate, it's absolutely not necessary to my happiness. So this totally speaks to me. Lovely recipe -- and the photos are amazing. Thanks so much! Thank you so much, KR! Means a lot coming from an accomplished cook and food photog like you! Thanks, Danyelle! And you can use my pate a choux for savory as well as sweet puffs. Would love the chicken florentine! 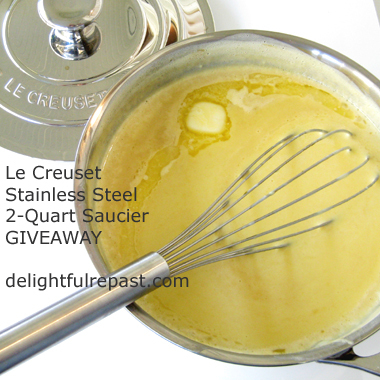 *Giveaway Winner Announced* - The winner of the Le Creuset saucier, by random drawing, is Julie (Charulie). Julie, as soon as you send me, delightfulrepast at aol dot com, your name, address and phone number (required by shipper), Le Creuset will ship the pan to you. Congratulations! If I don't hear from the winner of the random drawing by 11:59 am Eastern time Sunday, April 17, another drawing will be held and new winner selected from among the original entrants (those who commented before the giveaway deadline). This was fun! Watch for more giveaways here at Delightful Repast! In the meantime, follow me on Google and Twitter. You can even use the Follow Me By Email button in the right column. Yes, Sully, hang your head in shame. :D I wash my hands of you! No, you may yet develop more "subtle and nuanced tastebuds." I'm not giving up on you. Okay, I will! I have some strawberries, blueberries, and blackberries I want to use. Thanks! That will be delicious, Julie! I'm so delighted you stopped by The Marmelade Gypsy, Jean, and equally delighted to discover your blog! This looks like a wonderful recipe and I have a feeling it will be perfect for our make-and-take tea next month! Thank you, Jeanie. I'm going to want to hear more about the make-and-take tea! I love teas! Anytime, Keri! Happy to help. Can't tell you how delicious that looks! They are so elegant, but pretty easy...even for me! Thanks for linking this to Tuesday Cuppa Tea! Thank you, Ruth. Elegant, easy, and ohsogood with tea! Sorry I missed out on the giveaway. (It is been an incredibly busy time at work… And I am way behind on reading all my blogs!) That said, I really needed the pastry cream recipe much more than I needed the sauce pan! Thank you for that, Jean! You are so welcome, David! I hope you'll enjoy the recipe. Like me, you probably have quite a few pans! My goodness- that looks absolutely delicious. My Nana would LOVE that! This is so awesome of you to give us this opportunity! The first thing I would make would be a homemade chicken and rice dish! Starla, how I wish you'd found this post sooner! Unfortunately, the giveaway is now closed. But I do great giveaways several times a year, so come back soon. I post just once a week, so I'm easy to follow! I love the idea of adding the whipped cream at the end to lighten it up. I remember when I would make cream puffs, I always enjoyed the lighter fillings more than the custard ones. BRnLC, you'd probably really like them filled with the stabilized whipped cream. Be sure to check out that post -- that stuff is magic!